The 5.3L Flex Fuel V-8 (LC9), E85-capable (ethanol) with aluminum block and Active Fuel Management in our 2011 Chevrolet Silverado 1500 LT Crew Cab came with 315 hp and 335 lb.-ft. of torque in stock configuration. After initial break in on the 5.3L in our Silverado, we headed out to see what this truck had for power under the hood. Although the low first gear helped some, those ultra high 3.08 ring and pinion gears had to go. This was just what we expected but the fact that the truck was delivered with an optional trailering package and electronic locking rear differential, we felt complied to test the combination in stock form. The test included pulling a 3500 lbs boat trailer over 4000 foot Stevens Pass from Seattle to Wenatchee and then across Interstate 90 to Spokane, Washington. Although the truck never lacked on power on the trip, the transmission was constantly seeking to find the right gear. It got a bit annoying and we soon began discussing options to change this. A call to Agnar at Dave's Automotive was the first step in seeking professional help. More power, lower gears and a computer chip programmer were soon on order. 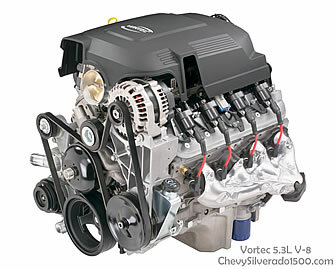 So begins the search for just the right accessories and aftermarket performance parts for the 2011 Chevy Silverado 1500. E85 Vortec 5.3L Flex Fuel V8 Aluminum Block Engine in our 2011 Chevrolet Silverado 1500 LT Crew Cab with a stock 315hp and 335ft of torque. This will be changing soon as the aftermarket add-ons start rolling in.